George Billis Gallery LA is pleased to present Uncommon, the gallery's first solo exhibition of paintings by Southern California artist Patricia Chidlaw. The exhibition features the artist's recent paintings and continues through November 1st. Chidlaw is an American realist seeking, and finding, profundity in the realm of the commonplace. She takes aims at dignity and a durable beauty amidst the rubble, ruins and soon-to-be-obsolete side routes of America. When asked what kind of paintings she makes, Chidlaw describes them as "Urban Landscapes" to distinguish them as paintings about areas of human habitation rather than landscapes that reference the natural world. But her subjects are certainly not all urban – some are suburban, some small towns and some are ruins, such as a faded sign and abandoned business bleaching in the desert sun as once populated areas return to their former empty silence. While she often treats older architectural forms, it is clear that these are not paintings about nostalgia – all are contemporary scenes, recently observed. 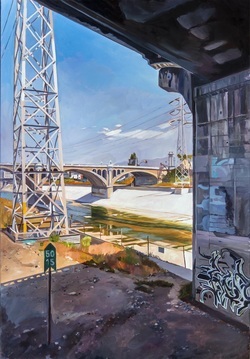 Recently the artist painted a number of pictures which seem neither urban nor rural but are set in that particular non-space that now covers so much of the landscape – the limbo of freeway exits and on-ramps and their attendant fast-food franchises. Chidlaw received her BA from the University of California, Santa Barbara. She lives and works in Santa Barbara. Her work appears in numerous private collections and has been featured in THE Magazine, ArtScene, Southwest Art, Artweek, and on KCET.